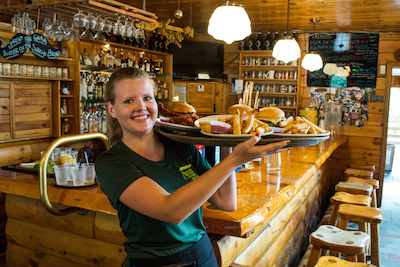 The Forks Restaurant (also known as the Kennebec River Pub & Brewery) is our full-service restaurant at The Forks Resort Center, at Northern Outdoors’ hunting lodge. 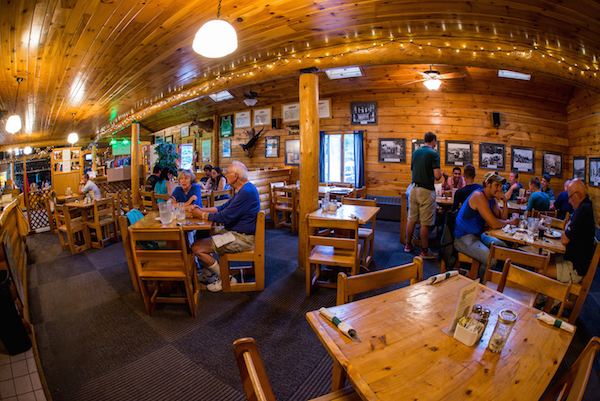 The restaurant shares space in our grand, open-timbered main lodge with our Kennebec River Brewery, home to several fine handcrafted ales and lagers, as well as a fully stocked bar. We use fresh, local foods to the fullest in our hearty breakfast, lunch, and dinner dishes. We serve delightful pub fare with a mouthwatering selection of jumbo burgers, our famous beer battered onion rings, and Northern Nachos – a heaping stack of tortilla chips with a melted blend of Monterey Jack and cheddar cheeses, jalapeños, black olives, onions, and tomatoes. Nothing compliments your pub fare any better than a fresh, handcrafted beer from our Kennebec River Brewery! Popular dinner entrée specials include our hand-cut steak tips, slow-roasted beef brisket, pan-seared fresh salmon, and MJ’s famous bacon-wrapped meatloaf. Start off your dining experience with our famous Magic Wings, fried pickles, or bruschetta! Don’t miss our ever-changing menu, homemade chili, chowder and soups, and fresh-made desserts. Try one of our six custom ales and lagers, from our Northern Lights ale to our Class V Stout. If beer isn’t your thing, we offer a full selection of wines and spirits, too.